The Affinity Cocktail is a variation of the perfect Manhattan that uses scotch, instead of rye or bourbon, as the liquor of choice. Flirting with sophistication the Affinity makes for an elegant aperitif style cocktail. Equal parts scotch, sweet vermouth, and dry vermouth with a dash of bitters are stirred and served up. The two vermouths I used in this recipe, Yzaguirre rosso & bianco, were crafted for drinking on their own but also work wonderfully in cocktails like this one. 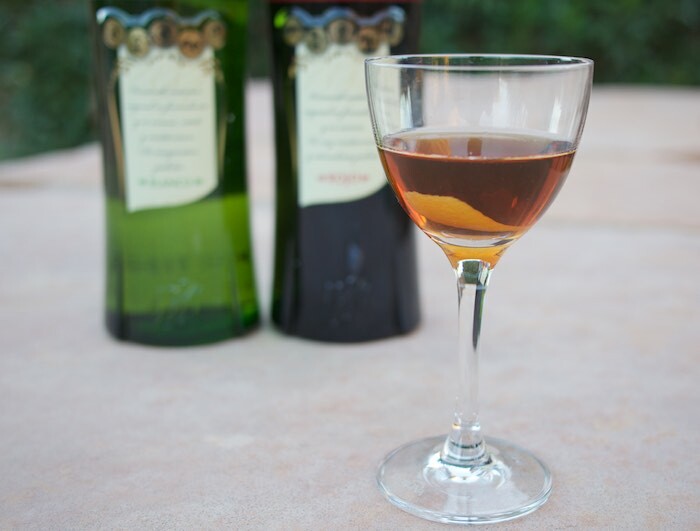 Produced in Spain these two vermouths are imported in the US by Fasel Shenstone. Try them served over ice with an olive & an orange twist or as part of a cocktail like the Affinity. Pour the ingredients into a mixing glass and stir well. Strain into a cocktail glass. Add lemon peel and enjoy. I don't drink...but if I did, I am sure I would like that! Wow! Now that's a cocktail I need after a long day with my three kiddos! I don't drink, but that's a beautiful color. Not a drinker these days either, but this sounds like an interesting combo -- never heard of anything like it! That sounds like a serious beverage! :) I usually stick with wine, but maybe for the holidays a few sips of this would be so warm and cozy!! I have no idea about any of those alcohols, lol, but I love the color! I'll take 10 please! :) Looks great! I have an affinity for this Affinity Cocktail, as should be obvious haha! Awesome recipe!